High protein, high fiber, tastes terrific - what more could you ask for in a salad? It is also a great source of fiber, iron, calcium, potassium and zinc. Quinoa is also fairly low in calories. 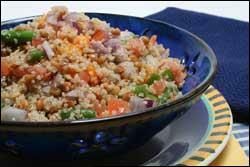 One cup of cooked quinoa provides about 222 calories. Another reason to love this quinoa and lentil salad, of course, is the lentils! Lentils have almost no fat (<1g saturated fat), zero cholesterol and about 9 grams of protein and 8 grams of dietary fiber. Lentils are also very rich in numerous other vitamins and minerals and provide about 179 mcg of folic acid per 1/2 cup serving. So, while this quinoa salad may look decadent and is actually pretty filling, it is a great way to get excellent nutritional value while enjoying the taste and texture of a great salad! with a fork to combine. Makes 12 servings, 1/2 cup per serving. Adapted from “Something Different”, written by Dana Jacobi, author of 12 Best Foods Cookbook and contributor to AICR’s New American Plate Cookbook: Recipes for a Healthy Weight and a Healthy Life.